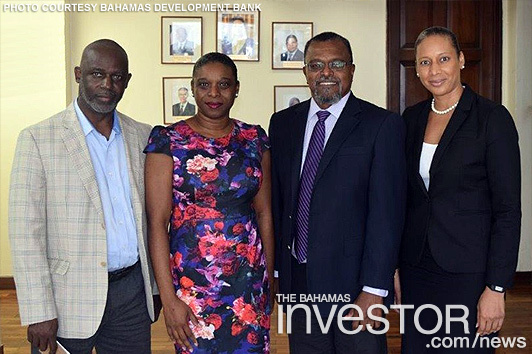 Bahamas Development Bank managing director Dave Smith along with deputy managing director Justin Sturrup paid a courtesy call on the Securities Commission to discuss the commission’s crowdfunding push and other potential capital raising instruments such as SMART Funds. The bank executives met with Christina Rolle, executive director, Securities Commission and deputy manager Sherinn Munnings. Smith commented that the bank is able to undertake a wide range of activities within its “sectorial approach” to support entrepreneurs, including term loans for small and medium-sized enterprises’ equity financing and executing agency services. In exploring new innovative ways to assist entrepreneurs, Smith noted that crowdfunding and SMART Funds might have the potential to augment traditional approaches to entrepreneurial funding needs. This year, the BDB celebrates its 40th year of promoting industrial, agricultural and commercial development in The Bahamas through the financing of, or the investing in, approved enterprises. A mission of the International Monetary Fund’s Statistics Department visited Nassau during October 16-22, 2018, to assist The Bahamas with the implementation of the Enhanced General Data Dissemination System, which was endorsed by the IMF’s Executive Board in May 2015. Minister of State for Grand Bahama Kwasi Thompson and permanent secretary in the Office of the Prime Minister Elise Delancy recently participated in an executive training course in e-government for Caribbean region policymakers and managers hosted by the Inter-American Development Bank in Estonia.